RobotWire EVO diamond wire profiling plant, equipped with CNC system, 7 axes controlled for wire inclination up 22.5° See on Pellegrini site. 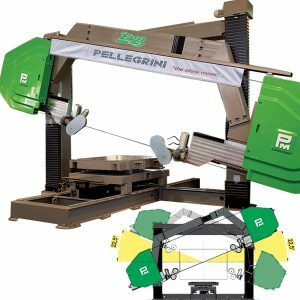 Ideal for cutting profiles – in two and three dimensions – out from blocks of marble, granite and ornamental stones, up to 2.6 meters width and 1.7 meters high. The seven controlled axes (block-carriage shift, platform rotation, distinct rotation of the two guide-wheel groups, and independent inclination of the two flywheels) use brushless drives. The Robotwire EVO represents an important evolution because the inclination of the diamond wire reaches an angle of 22.5°, which will allow a wider variety of shapes. The constant distance of the guide-wheels from the block – even varying the angle of inclination – and the electronic control system of the tension of the diamond wire grant the maximum cutting precision and optimize the performance of the tool. See also exhibition art video with Pellegrini’s Robotwire. Making a cone in this post.